Anneli Aila and Angela Ellis are the founders of Angeli Factory, a media service company specializing in post production. Angela is an editor and data manager for Angeli Factory in Boston/Berlin, Zero VFX in Boston and SRI International in San Francisco. Angela has also filmed for Producer/Director Barbara Rosenthal for over a decade. Anneli is a fine art photographer for Anneli Aila Photographs and the director of photography and color artist for Angeli Factory. She splits her time between Berlin, Germany and Boston. 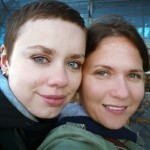 Angela and Anneli met at Germany’s Berlin Film Festival in 2007, and even with an ocean between them at times, they have been inseparable ever since. Recognizing the importance of this film, and with a deep respect for the team involved, they were more than thrilled to have had the opportunity to be a part of this project.